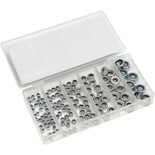 Contains: 160 x #5 flat washers, 60 x #6 flat washers, 20 x #8 flat washers. 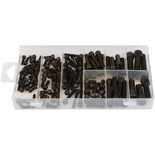 50 x M5 hex nuts, 50 x M6 hex nuts, 15 x M8 hex nuts. 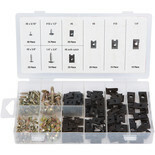 This handy nut, washer and bolt assortment comprises of all the most common fixings you need. 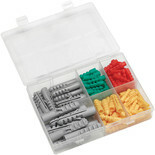 This 285 Piece Wall Plug and Screw Assortment set is perfect for porous for brittle walls that would normally not support weight with a screw alone. 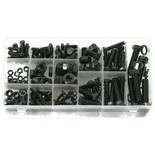 A useful selection of the most popular sized bolts with matching nuts. 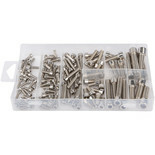 A pack of 500 7x30mm self tapping screws to be used with the pocket hole jig to join workpieces together to create tight strong joints. 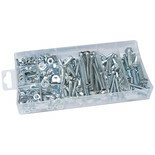 These metal drywall anchors are ideal foruse around the home and workplace. 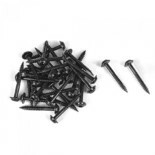 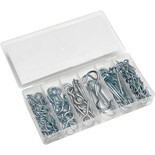 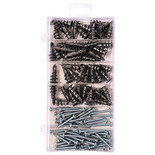 Each pack contains 50 zinc alloy anchors and 50 metal screws. Ideal for softer timbers, plywood and particle board as thread gives better holding power. 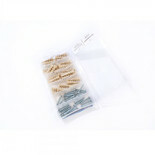 Pack of 500 coarse thread square drive self tapping wood screws used with the PH/JIG. 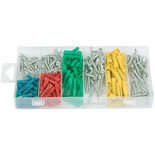 A set of 112 assorted wall plugs for 5, 6, 7, 8, and 10mm drill sizes. 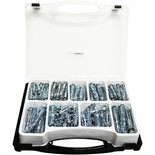 This 60 piece assorted plastic drywall set has been specially designed for walls that would not normally support weight with a screw alone.